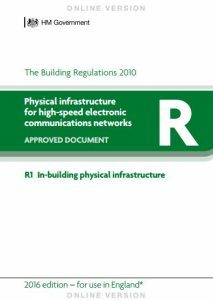 On the 1st October 2015, Regulation Part R - High speed network infrastructure became applicable to all buildings in England. Part R covers the standards for broadband connection. This requirement applies to all new buildings (including dwellings) and those subject to major renovation work to provide in-built physical infrastructure so that, in future, copper or fibre-optic cables or wireless device capable of delivering broadband speed greater than 30 Mbps can be installed. These provisions are applicable from the service providers access point to the buildings network termination point only.